Oops, this post is a long time coming. I simply forgot to add this one after I got back from Brazil. Well, that was a bad tournament. 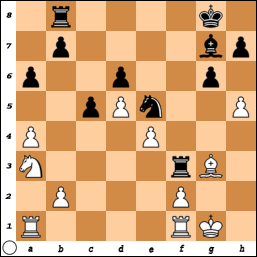 Last I updated this blog, I had 4 points from 6 games after losing with black to GM Vescovi. With 5 rounds to go, there was plenty of time for me to get back on track and vie for a World Cup spot. Unfortunately, things went downhill pretty quickly for me, starting with the 7th round. As Black against FM Ivan Nogueira, I beat my head against the wall as black in an Exchange French before acquiescing to a draw. Strangely enough, I avoided playing 1…e5 because against that, he played the Exchange Ruy Lopez (rather drawish), but against 1…e6, he had never played the Exchange French (instead opting for the more popular 3.Nc3. Thus, it was a bit of a cold shower to get the Exchange French. Against the Exchange French, I’ve played the same basic system for years: 1.e4 e6 2.d4 d5 3.exd5 exd5 4.Nf3 Nc6, and now the main line runs 5.Bb5 Bd6 6.c4 dxc4 7.d5 a6 8.Ba4 b5 9.dxc6 bxa4. I’ve played this for about 10 years now, and I have plenty of games in the database in this line. Generally, I’ve scored quite well here, as the position is reasonably unbalanced given that it once was a “boring” Exchange French. Black has the bishop pair and chances to stir up counterplay all over the board. However, on that day, I essentially ran into Nogueira playing Advanced Chess. After 19 moves, we were still in his preparation with Rybka, and I felt I had no choice but to accept a 3-fold repetition. Actually, I could have continued with some chances to outplay him an equal position, but at that point in the game, I wasn’t thinking clearly and didn’t want to risk anything. This was my first time playing the Fianchetto Benoni as white, and I hadn’t prepared it for this game. In fact, the last time I looked at it was back in March when I could have faced it against IM Miodrag Perunovic in Iceland! Thus, all the lines were hazy in my head, and the main thing I remember about the Korchnoi game was that what he did was fine, but that in the extremely messy complications that followed, the young Kasparov tactically outplayed him. I was kicking myself at this point, since now I’m stuck defending a worse endgame. Comparing minor pieces, my knight on a3 is pretty stupid and my bishop on g3 isn’t doing much. Meanwhile, his knight on e5 is sitting pretty on a central outpost while his bishop is unopposed on the long diagonal (and eyeing my b2-pawn). As I compared the situation of the rooks, my opinion of the position further decreased – his rook on f3 is quite active and can swing to b3 to target my weak queenside pawns, while his rook on b8 supports the …b5 push. Uh oh. In full damage control mode, I started to play pretty well and continued 25.hxg6 hxg6 26.Bxe5 (Black’s knight is better than my bishop, and I need the c4-square badly) Bxe5 27.Nc4 Bf4 28.Ra3!? (28.a5 is probably a bit better) Rxa3 29.bxa3 Re8 30.e5! Bxe5 31.Rb1 Re7 32.Rb6. I’m down a pawn here, but my pieces are no active while Black’s are relatively passive, and his extra c-pawn is securely blockaded for the time being. In the end, I managed to hold a draw here. So after two draws in which I didn’t generate any real winning chances, I was really ticked off and the following morning, played an absolutely horrible game against another young Brazilian FM, Yago de Moura Santiago. To his credit, he played a pretty solid positional game against my 3.Nc3 Nc6!? French (I wanted to avoid any preparation for once, and so I decided against my normal 3…Bb4 Winawer French), but I certainly missed some chances. By this point, I was down in the dumps. I had 4/5, and then managed a whopping 1 out of 4, with 3 opponents being clearly lower rated. With one more round that evening and then the final round the next day, I decided I could do something other than prepare and I sat down and watched about 4 hours of Season 1 of Lost. I guess it worked, as I won my 10th round game pretty easily in a Trompowsky (I decided to return to my 1.d4 roots by playing the Trompowsky, and in so doing, pushed my score with it up to 25/27, a nearly 2700 FIDE performance). Black has brought out all his minor pieces and has staked an about equal claim to the center. White’s structure is marginally better, as he his c3-pawn gives him nice control over the otherwise weak d4-square, while Black can’t do the same with his d5-square. 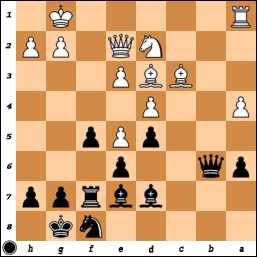 However, the knight on c4 is rather awkward and this is what gives Black an ok position here in my view. He immediately went wrong with 12.h3 0-0 13.Re1 Ne8!, threatening to transfer the knight to d6, when White won’t be able to avoid a bad queenside structure with b3 and bxc4. Black’s plan is relatively simple – he needs to create some open lines for his rook as the d-file doesn’t have any good entry square on it at the moment. To that end, I wanted to probe on the kingside, hopefully creating (e.g., …f5xe4, creating an isolated e4-pawn) or fixing a weakness (e.g., …f5-f4, fixing the e3-pawn) while preparing to break on the queenside with …b5. After about 30 more moves (making this the last game of the tournament! ), I managed to arrange all that and my opponent had to throw in the towel. I went for a plan with …f5-f4 and then arranged …b5. While my opponent’s rook got active behind my pawns, I managed to snag the f3-pawn and then my c- and f-pawns carried the day. I’m not totally convinced the endgame is winning despite all my maneuvers in the game, though, but it’ll take a long time to figure out the “truth” about this position. So, my tournament was a bit of a disaster, but at least I managed to avoid a total crash and won my last couple games. My finish of 7/11 was good enough for a tie for 29th place. GM Josh Friedel tied for one of the World Cup spots with 8.5/11, but in the rapid chess tiebreak, he wasn’t able to grab one of the 4 spots available. The tournament was won by GMs Shabalov and Corrales with 9/11. Right now, I’m in São Paulo, Brazil playing in the Pan-American Continental Championships. The tournament started about a week ago, on the 25th. The US has 6 players here (GMs Ehlvest, Shabalov, Kudrin, Friedel, Ivanov, myself, and FM Gregory Markzon). Last year, the Pan-American was held in Boca Raton, Florida, and there was only one spot up for grabs for the 2009 World Cup in Russia. This year, there are 6 spots open, and that fact, coupled with a better location (for most of the rest of the Americas), there are close to 270 players in the event. Black was having some troubles untangling his pieces, but this move leads to a clearly worse endgame. He can’t capture on d4 because of 17.e5; meanwhile, if the pawns stays on e5, the knight can’t leave d7, leaving the bishop and rook stuck on c8 and a8. Meanwhile, putting the bishop on c7 guards the e5-pawn, but can run into Nc3-d5 tactics, as there are pins on both the c-file and h4-d8 diagonal. Thus, the computer recommends …Ba7-b8 as the best plan, which was surprisingly what I thought was best during the game as well! However, my opponent played 16…Qd6 and went down quickly after: 17.dxe5 Qxd1 18.Rcxd1 Nxe5 19.Nxe5 Rxe5 20.f4 Re8 21.e5 Nh7 (if 21…Nh5, then 22.Rf1 leaves the knight stranded on h5) 22.Ne4 Bc7 23.Nd6 Bxd6 24.exd6, and White is simply winning. 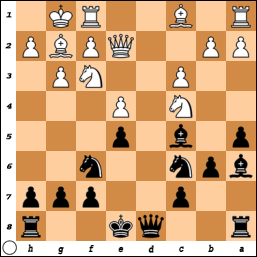 Black has no way to stop the d-pawn and an invasion of White’s rook to the e7-square. In the second round, I faced Brazil’s representative in the World Youth Under-18 category, Vincius Tine Martins. The game was completely crazy from the get-go, as neither of us had really prepared the Moscow Gambit of the Semi-Slav, but we played into it anyways! After almost 5 hours of play, we agreed to a draw when I set up a fortress in an otherwise worse endgame. This second day of the event featured a double-round schedule (at 10 AM and 7 PM). However, the round was not at 7 PM, but at 6 PM! How did mix-up this happen? Well, the organizers had tournament pages in English, Spanish, and Portuguese. The round times had been updated before the tournament started on the Spanish and Portuguese pages, but were left as is on the English page! Thus, my printout from the day before the event showed the round at 7 PM, as does the Google search cache, for example. The page info shows it was updated during the morning round, but they made no effort to inform the players of the change. The first round started 2 hours late, and I was there, waiting during that one, and I was about 10 minutes early for the 2nd round the following morning. The organizers and arbiters made no effort to apologize or make up for the situation by giving us our time back, even though it was quite clearly the organizers mistake. They just kept repeating the phrase “the website was wrong,” as though that somehow made it ok for us to start our games with 45 minutes to make 40 moves. To make things even better, they passed out brochures with the “correct” round times on it during that round, but of course it was too late to do us any good. In any case, that round was not a good one for the Americans – Friedel and I drew our games quite quickly, Ehlvest lost his way close to the time control and went down, while Shabalov also drew. This is a very old line of the Giouco Piano where Black is up a pawn, but White has a somewhat dangerous pawn on e6 and better development. Essentially, if Black can make it to an endgame or get his king to a relatively safe place, he’s much better. 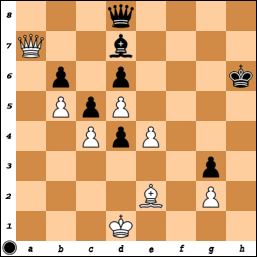 But in the short-term, White’s initiative can be tricky to defuse. 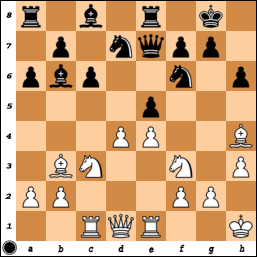 He played the correct 17.Re3 c6 18.Rh3!, as White’s pawn structure doesn’t matter too much here. 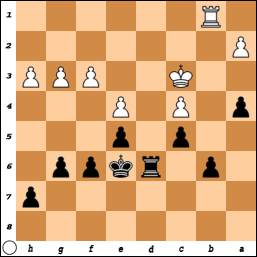 He needs a way into Black’s position, and so he targets the h5-square. After 18…Rxh3 19.gxh3 g6, he played 20.Qd2, aiming for 21.h4 and 22.Qh6. I played 20…Kf8, and after 21.h4 gxh4 22.Qh6+ Kg8 23.Re4 Qa5!, threatening to head over to g5 to force a queen trade, the game was essentially in the bag for me. Since White can’t stop …Qg5, he’s pretty much already lost. He struggled on for a little while, but once we made time control, he gave up the ghost. In round 5, I had the white pieces against FM Duvan Martin Castano, who won the Colombian Championships with a perfect 9/9 score! I doubt they had the $64,000 Fischer bonus prize for a perfect score though. What would you play here as White? I played 37.Qa3!, when White is clearly on top. Black’s best would now be to give up the g3-pawn as a lost cause and hope for a miracle draw, but he pushed on with 37…Kh4, but after 38.Qf3, his king is feeling a bit short of air. 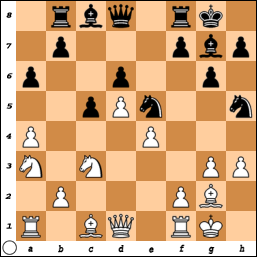 After 38…Qg5, I played 39.Qf1 (39.Qf7 was even simpler), threatening a mate on h1. 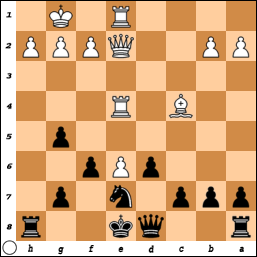 The only move is 39…Qe5, as Black needs to stay in touch with the f4- and f6-squares while making luft. Then I played 40.Qf8, when the threats on d8 and h6 are too much. He played 40…Kg5 41.Qd8+ Kf4 42.Qxd7, but he has no hope in this position. The game ended 42…Ke3 43.Qg4 Kf2 44.Qf5+! Kxg2 45.Qf1+! Kh2 46.Bf3, and mate on g2 is unavoidable. In the sixth round, I played up for the first time in the event, against the #2 seed GM Giovanni Vescovi of Brazil (2631 FIDE). Vescovi has been Brazil’s best player for a number of years, and had regularly been a member of the top 100 players in the world. I was short on time here, having only about 10 minutes for the next 15 moves. I played 26…f4?, wrongly thinking that I had to stir something up on the kingside to compensate for my weakened queenside. 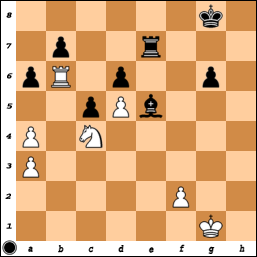 Unfortunately, after 27.exf4 Rxf4 28.Nf3!, White secures the d4-pawn and now Black is in real trouble. I pushed the a-pawn up to avoid its capture on a6, but after 28…a5 29.Qd2, Black’s rook is offsides and the a5-pawn falls. I resigned in a few more moves. The correct move was 26…Qc7! (not 26…Qc6, which allows 27.Ba5! with a clear plus), when White has some trouble defending his bishop. The rook is tied to the a-pawn, and going back to b2 simply repeats the position after 27…Qb6. Thus, White would probably play 27.Nb1, but this is clearly some concession on his part, as the knight is not well placed on b1. After 27…a5 28.Qe1 Bb4!, White can’t simply take twice on b4 because of 30…Qc1+ and 31…Qxe3 (taking advantage of the fact that the knight on b1 shuts in the rook on a1). 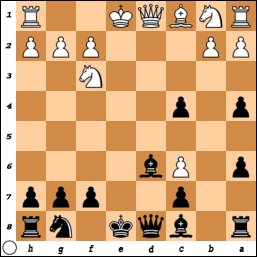 This tactical trick buys Black a valuable extra move or two to safeguard his queenside structure. Yes I can – not post in November?! Somehow I managed to not find the time to blog during the month of November. Pretty amazing, given that I was only playing one event in Florida during that time. Anyways, I’ll try and be more responsible about my blogging duties going forward. My one tournament in Florida was the Pan-American Continental Championship during the first week of November. The tournament went alright for me, as I finished with 6.0/9, good enough for a tie for 4th place. GM Jaan Ehlvest took clear first with 7.0/9, while then GM-elect Josh Friedel (now a GM) and GM Alexander Ivanov tied for 2nd and 3rd with 6.5/9. I gained a few points, but nothing amazing. I lost only one game, in the 2nd round as white against the young Colombian IM David Arenas. The game can be seen at Josh’s recap for the USCF website, Chess Life Online. I really struggled in the first half of the tournament, having to work very hard to get a couple wins as black against 2200s, while losing with white against Areans and playing a topsy-turvy game that ended in a draw against FM Alex Betaneli. These four games were rather disappointing, as I normally play much better than that. Starting with round 5, though, I got in gear with a smooth win over FM Jake Kleiman as black. Then I crushed IM Dionisio Aldama as white. I played the same piece sacrifice I used against Bryan Smith at the Western States Open – which I wrote about here – but this time, I didn’t spend 65 minutes coming up with the 4 move sequence. With plenty of time on my clock, I managed to put Aldama away without much trouble. Only half a point off the pace at that point, I slowed to a halt by drawing my last 3 games against GMs Leon Hoyos, Stripunsky, and Lima. In all 3 games I had good/great chances to win, although in the last game against Lima, I managed to throw away my advantage and had to hang on to a draw. Ehlvest played great to win the tournament comfortably – he was perfect with white, and while he ran into some small troubles in a couple games as black, he navigated those waters well and came out unscathed. Friedel had a chance to tie for first with a win as black against Becerra in the last round, but the endgame proved to be too tough to play during a short time control, and the game ended in a draw. On a side note, my game with Aldama exemplified one of the strange aspects of US tournament play. Despite the fact that this tournament was FIDE rated (it was a FIDE Zonal event after all!) and that it was advertised as using FIDE rules, the tournament directors did not forfeit Aldama when his cellphone rang during a game. This happened twice, the second coming during the game against me. They didn’t impose a penalty either time either. Normally submitting an event for FIDE rating purposes means the event MUST use FIDE rules, but FIDE seems to turn a blind eye to the USCF’s use of their own rules. However, in a tournament advertised as being under FIDE rules, this was a weird incident. GM Nigel Short was forfeited earlier this year when his phone (which both players agreed was off) gave a low-battery warning beep! The story is here. The tournament itself was reasonably well run. It’s disappointing that a Continental Championship attracted only 60+ players, when it’s the championship of North and South America. Part of the reason may have had to do with the fact only 1 spot was up for grabs in the World Cup, when normally there are 6 or 7 such spots. Another reason is that Boca Raton is not the cheapest place to stay for a week – the regular room rent at the Marriott we stayed at was listed at $475/night! The hotel was nothing close to special, however – the area is just that expensive. The fact it was in the US, as well, meant that Cuban players couldn’t play in the event. This seemed to me to be a bone-headed move on FIDE’s part, as why disqualify a country from playing in the zonal event? Tangentially, while Boca Raton is an expensive area, it was definitely McCain territory. We were there during the election on November 4th, and it looked at first like a victory rally for McCain was being set up behind the hotel. Of course, that victory never came to pass!